BYU has looked both promising and dreadful this season. Which is it going to be Saturday at Boise State? Boise • Sure, Utah has defeated BYU seven straight times and Utah State has gotten the best of the Cougars in the last two battles for the Old Wagon Wheel. But no college football team that has played BYU regularly the past 20 years has eked out more close victories over the Cougars than the Boise State Broncos. That is especially true at Albertsons Stadium, where Boise State is 4-0 against BYU, with three of those wins coming by a single point. Both teams have two wins apiece in Provo. The independent Cougars (4-4) and Broncos (6-2) of the Mountain West Conference renew their rivalry on Saturday night on the blue turf in front of what BSU coach Bryan Harsin expects to be a sellout crowd, meeting for the seventh-straight year. Can BYU finally break through with a win? Boise State is a two-touchdown favorite, has a four-year starting quarterback on the verge of becoming the MWC’s all-time passing yardage leader, and has scored 104 points in its last two games. BYU freshman Zach Wilson will make his first road start, third start altogether, in front of a hostile crowd that relishes the Cougars’ visits unlike any other opponent it sees. “It is a big game,” Harsin said. “This is a game our players enjoy. This is a game fans really enjoy. I expect it is going to be packed. There are a lot of connections between the two teams, whether it is fan-related or recruiting-based or proximity. “It is one of those fun games to be a part of and there’s been some good ones over the years. BYU is a well-respected program and I think Boise State is as well,” Harsin continued. Absolutely, according to the Cougars. • In 2004, BYU fell behind 16-0, but roared back and looked like it was going to muscle out a last-second win. But Matt Payne missed a 38-yard field goal — some Cougar fans still insist it was good — with 19 seconds remaining and BSU escaped with a 28-27 win. • In 2012, freshman Taysom Hill replaced injured senior Riley Nelson and drove the Cougars 95 yards for a touchdown late in the fourth quarter. But coach Bronco Mendenhall called for a two-point conversion attempt to get the lead, and it backfired when Hill’s pass fell incomplete in the end zone. Boise State’s only score came on a pick-six by defensive tackle Mike Atkinson. • Boise State’s 55-30 win in 2014 was never close as Mendenhall took over the defensive play-calling from Nick Howell and watched the Broncos put up 637 yards of offense. • The Cougars also appeared to be on the verge of winning the 2016 game, but David Moa blocked Rhett Almond’s 44-yard field goal attempt with 16 seconds remaining to preserve another 28-27 Broncos win. 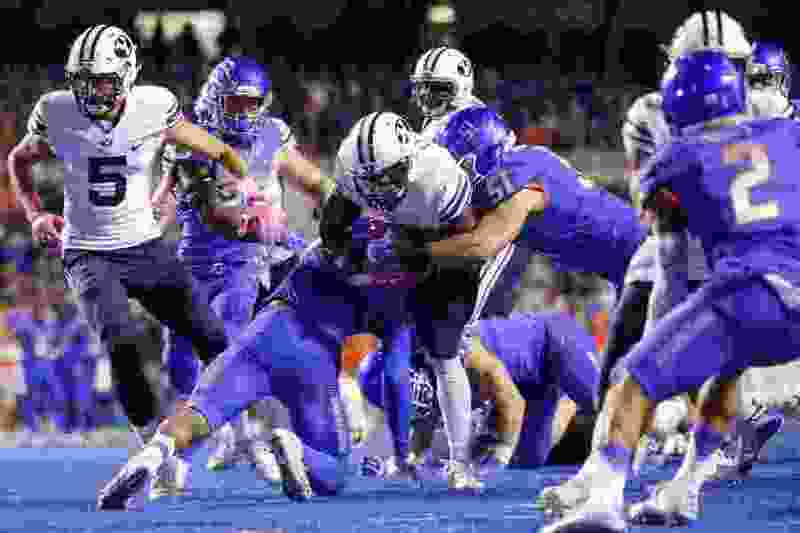 Obviously, the Cougars will have to put up more points than they did last week in the 7-6 loss to Northern Illinois, a loss that evened Sitake’s overall record to 17-17. Sitake has spent the week urging the offensive and defensive coaches to be more aggressive, and telling Wilson to “let it fly” as he directs the offensive attack. “If we focus on ourselves and find a way to have more consistency, we should be good,” Sitake said. Offensive coordinator Jeff Grimes coached Boise State’s offensive line in 2000, still keeps in touch with at least a half-dozen members of BSU’s coaching staff, and knows how difficult it is to win at Albertsons. Kickoff • Saturday, 8:15 p.m.
About the Broncos • They are 25-1 in nonconference home games since the start of the 2006 season, losing only to Virginia, 42-23, in that stretch. … QB Brett Rypien needs 250 yards to become the Mountain West’s all-time passing yardage leader. He has thrown for 12,441 yards. SDSU’s Ryan Lindley had 12,690 yards. … They are averaging 40.1 points per game and giving up 24.6 points per game. They are averaging 486.4 yards per game and giving up 359.2 yards per game. About the Cougars • This will be their 100th game as a college football independent. They are 60-39 in those games and have played teams from more than two dozen different states, but no out-of-state team more often than Boise State. … They have played 25 freshmen this season, including 15 true freshmen, and 11 have started in at least one game. … Freshman QB Zach Wilson, who committed to Boise State before signing with BYU, will make his third career start, and first career start on the road.